Review | Sports cars are fun, but not sensible. Family cars are sensible, but no fun. That's why many brands offer hot hatches: sporty cars that still offer all the space and practicality of a family saloon. 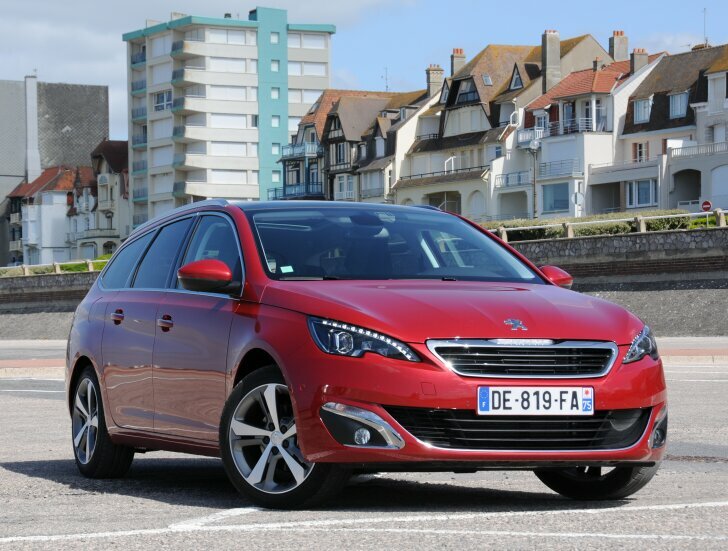 Peugeot found a very different combination of fun and practicality and named it "308 SW". Find out how Peugeot combines sense and sensibility. "A sports car? It looks like an ordinary estate car!". Yes it does, at least on the outside. Take a seat behind the steering wheel and the 308 SW does differ from other estates. Just as in a sports car a tiny steering wheel pierces far into the cabin. The driver is forced to take an active seating position "around" the wheel, instead of lazily laying back and grabbing the bottom half of the wheel. Thanks to Peugeot's setup, the driver automatically has more control over the vehicle. Also: the speedometer and rev counter are now positioned above the steering wheel, making them easier to see. This daring setup does provoke many different reactions, but as far as Autozine is concerned this setup alone is reason enough to choose a Peugeot. Another thing that makes the 308 special is the minimum number of buttons and dials on the dashboard. Almost all functions are controlled via the centrally located touch screen. This even goes for the climate control. What remains are a single volume knob for the stereo, a button for the hazard lights and the controls of the air vents. As it should be with a car of this generation, the satnav can be extended using "apps". At this moment the apps are limited to finding restaurants, cheap filling stations and the odd speed trap. The advantage over the same apps on a smart phone is that the car can enter a destination into the satnav with a push of a single button. Peugeot also offers apps for e-mail and social media, but those have no extra value since the car cannot read messages aloud or enter text by dictation. Peugeot also offers apps that run on a smart phone. For example, there's an app that registers driving behaviour which can be used for tax purposes or to learn to drive more economically. Since these apps use Bluetooth to communicate with the car, there's no costly data plan required. The owner's manual is also available as an app. Using augmented reality it suffices to take a picture of a car part, after which a detailed explanation of that part will be shown. For example, by taking a picture of a wheel, instructions are shown on how to use the tyre repair kit. The head and legroom in the front are fine. 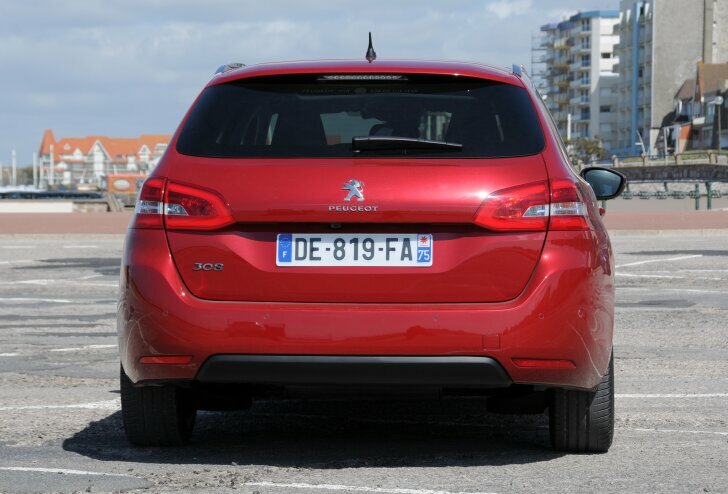 The 308 SW has an 11 cm longer wheelbase than the regular 308. Three centimetres are utilised to improve legroom in the rear; the remainder benefits the boot. The luggage space measures 610 litres and that's a decent value for a car of this size. The boot lid is exceptionally large, making it easier to load and unload. By pulling a lever inside the boot the back seat is folded. Removing the rear headrests, folding the bottom half of the back seat or other complex procedures aren't necessary. After this the boot measures 1,660 litres; which puts Peugeot in second place in the race for the biggest boot in its segment (only Honda does better with the Civic Estate). To make sure all that space can be used efficiently, Peugeot fits nets, fixture points and even a high voltage socket as standard. This turns the SW into more than a lifestyle car, making it a true workhorse. Once on the road, the similarities with a sports car present themselves once more. The tiny steering wheel means that even a slight twist of the wrist is enough to corner. Yet again: one either loves or hates this, so do try it for yourself if you consider a 308. What really sets the 308 apart from its competitors is the quality of the underpinning. Without getting nervous or rock hard, the 308 offers sublime handling. Just like with a sports car the 308 SW can turn corners at much higher speeds than regular cars. This doesn't just make the 308 SW fun to drive, it also makes it a safe car. If one ever underestimates a corner, it suffices just to keep steering in the right direction; braking isn't necessary. Even in a blind panic it isn't necessary to make an emergency stop, just steer around the hazardous object. 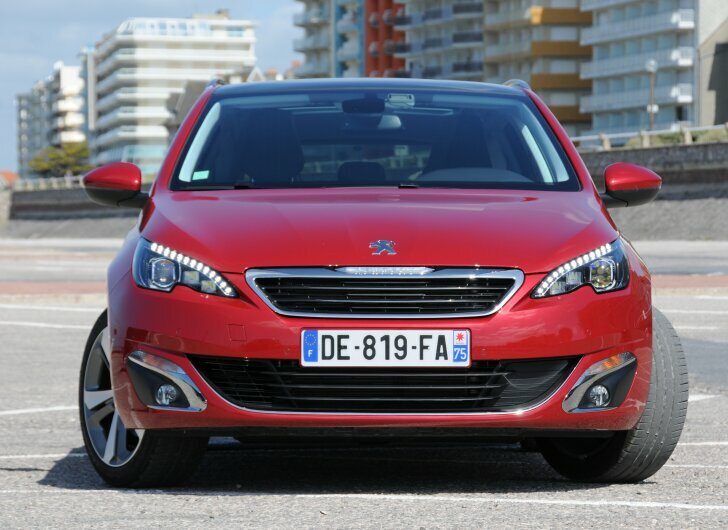 With the 308 SW, Peugeot introduces two new engines for the 308. The first is the 2.0 BlueHDI. "BlueHDI" is Peugeot's label for a new generation of diesel engines that combine high power with low fuel consumption. In real life this new technology is hardly noticeable and that's exactly how Peugeot wants it! The 150 PS / 370 Nm strong diesel engine does its duty with relative ease. The engine isn't eager or lively, but it always punches so much extra power that one speeds without even noticing. The test car did 51.9 mpg, which is a lot worse than the 74.2 mpg that Peugeot promises the new engine will do. 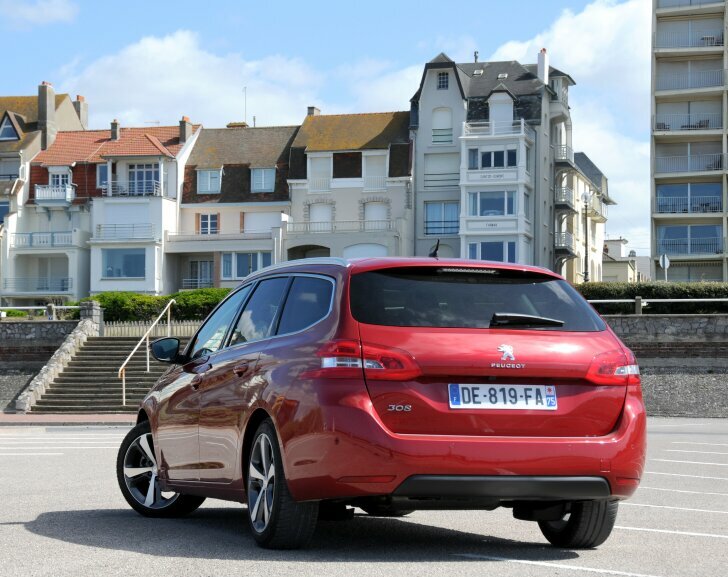 The most valuable new engine for the 308 is the newly developed three-cylinder "e-THP" petrol engine. By opting for three, instead of the usual four cylinders, an engine is naturally more efficient (less moving parts, less internal friction). A well-known problem with three-cylinder engines is a less refined run, but Peugeot managed to suppress this very well. And... it is this small engine that again reminds of a sports car. For an engine of this size the performance is remarkable! Accelerating from 0 to 62 mph takes exactly 10 seconds and the top speed is 127 mph. More important is its lively character. Even the tiniest movement of the right foot is enough for an instant reaction, making the car feel quicker than it actually is. According to the brochure the e-THP does 60.1 mpg. To put it mildly: that's a very optimistic statement. Even when driving as slowly and carefully as possible without slowing down traffic on a flat surface (no hills), 48 mpg was the best possible figure. It's only in this respect Peugeot that still cannot beat similar products from VAG (Volkswagen, Skoda, Seat) and Ford. When it comes to performance and CO2 emissions (read: tax cuts) Peugeot now ranks with the best. Those who really crave the feeling of driving a sports car can press the "Sport" button. The speedometer and rev counter will be illuminated in red and a "power gauge" pops up. It shows how much horse power, torque and turbo pressure is being fed to the wheels. The engine noise is amplified and the reaction of the throttle is even more alert. In fact this doesn't make the car any faster, but it certainly makes the 308 SW even more fun to drive. 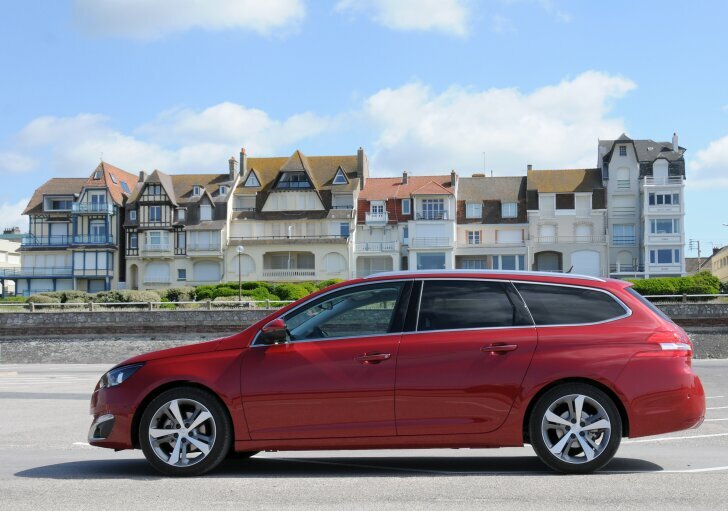 The Peugeot 308 SW is a mid-sized estate car and that means there's lots of competition. To distinguish itself from the masses Peugeot chose a daring setup. The 308 is a mix between a sports car and a regular car. The result isn't a sporty family car, but a car with a sporty seating position and exceptional handling. The "SW" offers everything the regular 308 has to offer and adds a huge boot to that. The 308 estate looks even more harmonious than the 308 hatchback, so many will prefer the SW because of its looks alone. With the introduction of the 308 SW two new engines have been introduced. The "2.0 BlueHDI" is powerful yet frugal, but not stronger or more efficient than similar engines from other makes. The "1.2 e-THP" petrol engine is a real gem and shows how sense and sensibility can be combined.